That is when the brunch bit comes in… This saturday, the brunch kind off became very late lunch, We had a Pot Luck invitation and I was busy fixing that… Anyhow, by about 2:00 pm Prithwish (my husband) was growling, more like his stomach was and I had to whip up something very quick. At this time, no ingredient is as handy as eggs and thanks to a very easy and quick recipe that I had come across in Nigella Lawson’s site, brunch was ready in 15 mins.. 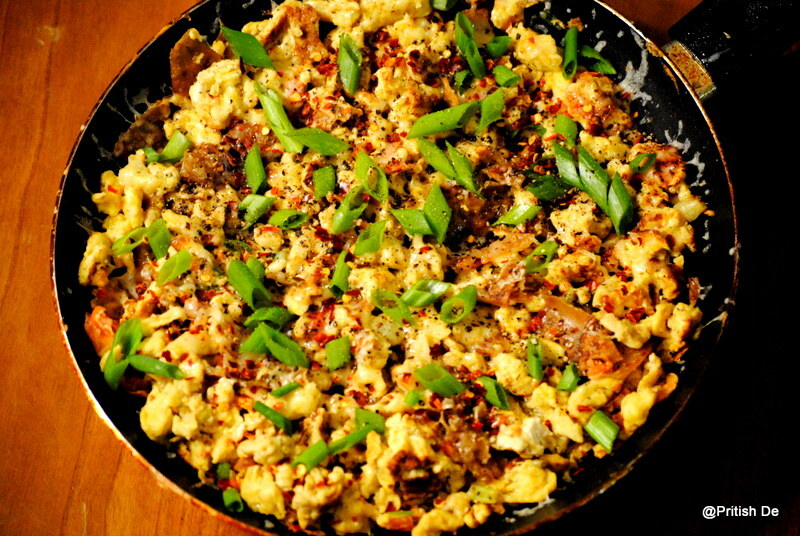 Here is what the recipe read; Mexican Scrambled Eggs, I stuck to the basic recipe but since it was for the 2 of us, I used 7 large eggs, 2 large tomatos and I did not have corn tortillas at home so I used 3 large wheat tortillas.. 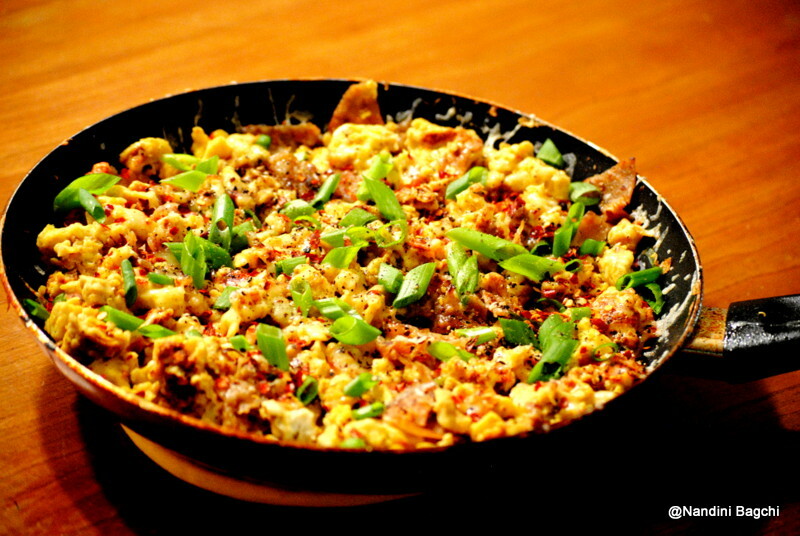 The rest of the recipe was same, only at the end of it, I grated some smokey cheese on top of the scramble and garnished with chilly flakes, that gave a very spicy twist to the whole dish and all I can say was nothing was left on the skillet…. This looks like a great breakfast. The mexican cuisine does have a way with eggs-yum! 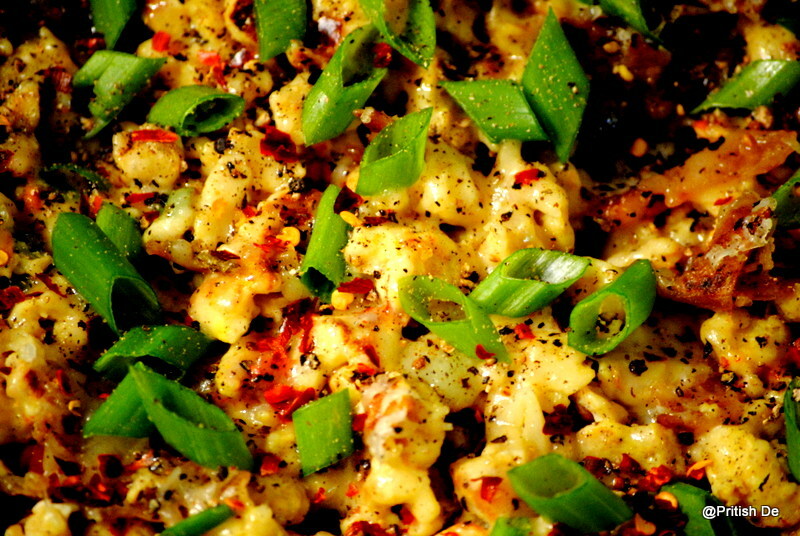 I love migas but this looks even better-very enticing photos.. Thanks for the link and I am more of a fan of flour tortillas than corn so I give that change a thumbs up! 🙂 totally agree,, how have you been??? all good at work?? ?